The Mini Solar Racer is a toy car which claims to be the world's smallest solar powered car. The solar panel allows the car to move from eco-friendly solar energy when the car is placed either in sunlight or under a bright artificial light. 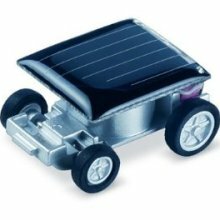 The Mini Solar Racer is a helpful toy to demonstrate both the abilities of solar power and the advancements in technology that allow a solar powered car to be made to such a significantly small size. The toy car measures an astonishing 3.3 cm x 2.2 cm x 1.4 cm (1.3 in x 0.87 in x 0.55 in) which does mean its not suitable for children under 3 due to small parts (up to and including itself! ).